Very soon after I discovered computer graphics, a bunch of years ago, I had this fascination for 3D programs. I'm talking about the early 90's here. Back then, there was this program (I can't even remember the name) I got myself a demo copy of, but I remember modeling being painful and texturing pretty non-existent. Lighting was extremely basic too. Since then, I could not keep the promise to myself to learn some 3D program. That is, until a few years ago, when I started to play a couple of games for the Mac. These games (EV Nova and Redline) share both a structure based on plugins. Users can create their own additions to the game, upload them for everybody to use, and basically have fun with them. In the case of EV Nova, it's mostly spaceships and laser guns. In the case of Redline, it is racing cars. Of course, in order to create these assets you need to be able to create the model and the textures for your model, or have somebody else do it for you. I decided this was my perfect excuse to learn 3D modeling (by the way, does anyone know whether it should be spelled with one L or two L's?). I checked some of the available 3D packages for the Mac. I even tried some open source ones like blender and Wings3D. 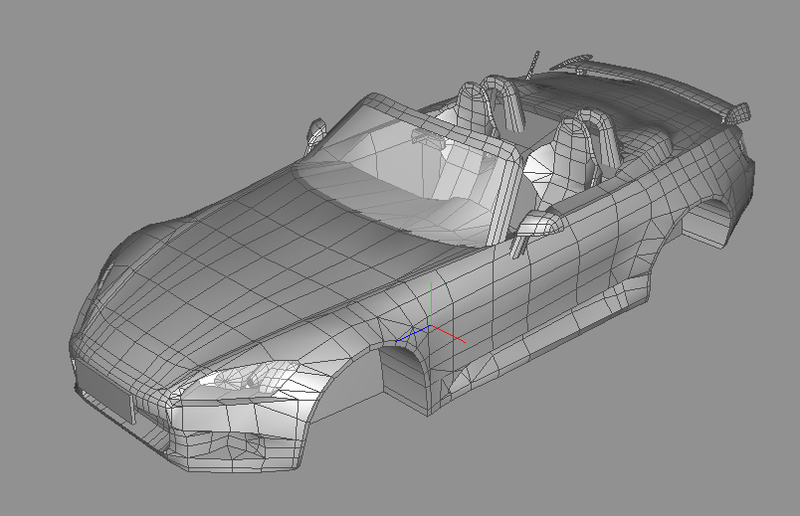 I finally decided to buy Cheetah3D, a Mac-only 3D program developed by Martin Wengenmayer. It is very user-friendly (compared to ice age UI's found in other packages), and it's pretty cheap, plus it does well 100% of the stuff you need the most. With this, I created my first car for Redline, a Honda S2000 (I love that car!) 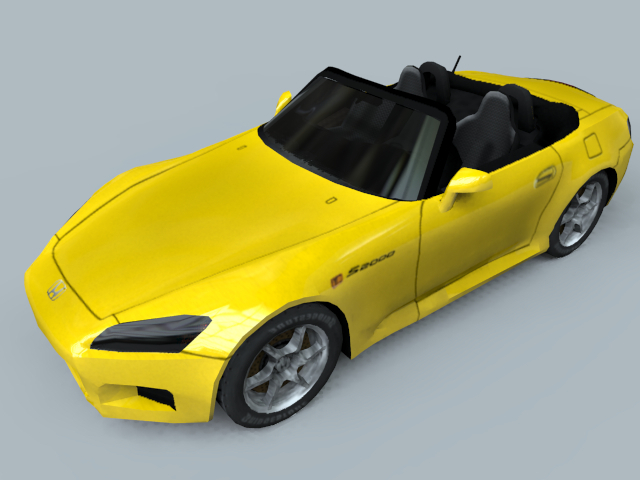 modeled entirely in Cheetah3D. Although my intention with this blog is not to go in strict chronological order, I'd like to start by showing an old render of this car. It is a low-polygon model, because models used in games need to have few polygons, so as not to bog down in-game performance. Generally I tried to shoot for something around 6000 polygons per model—not much compared to a full fledged model, which can range in the 250-500K polygons. Here are a couple of pictures of the 3D model. One is a render done in Cheetah3D, with global illumination (GI) and Radiosity, the other one is a screenshot of the model within the program. In some other post I'll explain more about GI and Radiosity.